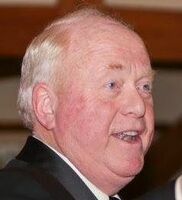 Robert L. Parker, age 65, a longtime resident of Chelmsford passed away Sunday, March 17, 2019 at Brigham and Women’s Hospital in Boston with his family by his side. Nearly six years after the initial diagnosis, Robert’s hard-fought battle with glioblastoma multiforme brain cancer came to an end. He was proud to represent the less than 5% of patients who survive five years or more with glioblastoma. His family will always consider him to be a miracle. Robert was born in Lowell on May 18, 1953, and was the son of the late Lester and Beverly (Cochrane) Parker. He was a 1971 graduate of Chelmsford High School and a dedicated employee of Standard Motor Products, Inc. of Long Island City, NY for over 35 years. Robert was the beloved husband of Annmarie Roark and recently celebrated their 38th wedding anniversary. 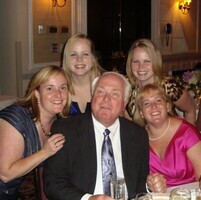 He and Annmarie were blessed with four beautiful daughters, and he took great pride in their accomplishments. He was the grandfather to three grandsons, and he never missed an opportunity to spoil them with ring pops and soda. Robert was often found on the golf course during the warmer months or skippering his family and friends around Lake Winnipesaukee. He enjoyed classic cars, Harley Davidson motorcycles, and never turned down chocolate ice cream or black jelly beans. Robert will be remembered for his infectious smile and ability to find humor in every situation. In addition to his wife, Robert is survived and will be deeply missed by his daughters, Amy Norander and her husband Steve of Goffstown, NH, Elizabeth Parker Kittredge of Chelmsford, Jessica Parker D’Angelo and her husband Michael of North Andover, and Heather Roark Parker of Chelmsford; his three sisters, Cynthia Gavriel and her husband Ted of Tyngsboro, Suzanne Starr and her husband Stephen of AZ, and Kimberly Parker of Nashua, NH; his three brothers, David Parker of Dunstable, Douglas Parker and his wife Darlene of Manchester, NH, and Jeffrey Parker and his wife Judy of Townsend; his grandsons, Peter and Bennett Kittredge of Bedford, and Zachary Norander of Goffstown, NH; his aunt, Mildred McAulay of TX; his mother-in-law, Mary Roark of Chelmsford; his Roark family in-laws; and many nieces, nephews, and cousins. Visiting hours will be held on Thursday from 4-8 pm at the Blake Chelmsford Funeral Home, 24 Worthen St., Chelmsford. His funeral service will take place in the funeral home on Friday at 1 o'clock. Interment to follow in St. Joseph Cemetery, Chelmsford. In lieu of flowers, memorial donations in Robert's name may be made to the National Brain Tumor Society, 55 Chapel Street, Suite 200, Newton, MA 02458. 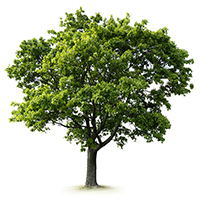 To plant a memorial tree in honor of Robert L. Parker, please visit our Heartfelt Sympathies Store. Deepest condolences for your loss. May you take comfort in knowing that loved ones who leave us are never really gone- they are as much a part of us as branches to a tree. My name is Steve Burt. I worked with Bob out of Vermont with Standard Motor Products.. I tried to get to his services but we had a severe weather warning with snow piling up. Bob was a great guy with a great sense of humor. We almost always got some golf in when he was up to see me. I was doing field work with Bob on 9/11 in the Boston area. Both my wife, Christine and I feel very bad. When in the Burlington area on an overnight he always invited Christine to dinner with us. He was a great guy and I feel lucky to have known him, All my sympathies to his family. Bob was a person who I have know for 33 years through our time working at Standard Motor Products . While we did not see each other often as I live in Canada. and only during training or meetings, it seemed we always ended up seated next to each other during many of these sessions. The last time together was in Dallas is 2016, during recurrent training. Bob was the same, candid, funny, interesting and despite his medical challenges, remained the positive person he always was. I was very much looking forward to seeing him at our upcoming 100th Anniversary celebration. I will miss him and pass on my thoughts to his family and many friends. 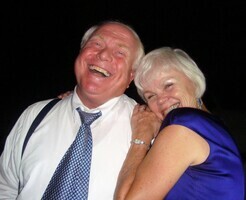 Dear Annmarie: It is with great sadness that we just heard of the passing of your husband. Please accept our deepest condolences. Our hearts go out to you and your family. Sara, Francoise and Mike and the team at Express Employment Professionals. Thank you, it was good to see you and Peter.